It's tough when your knitting turns on you. It may be Makers' Monday, but I'm not exactly celebrating my own knitting achievements today. I've been doing so well lately with staying on track with my knitting and getting the pieces on my To Do list knitted, finished, and shipped as necessary. I've been doing so well at it that the skin on my forearm has become overly sensitive and sore from my shirt sleeve/cuff rubbing against it as I knit. That's a lot of knitting! And then there was the knitting for puppies issue. 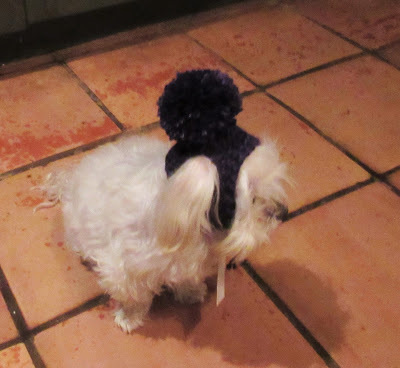 I had an Etsy customer who bought a hat and wondered if I could knit her little dog a hat with a matching pompom. I went in search of dog hat patterns to get some ideas, (there aren't many out there) and came up with a design that I thought might work. 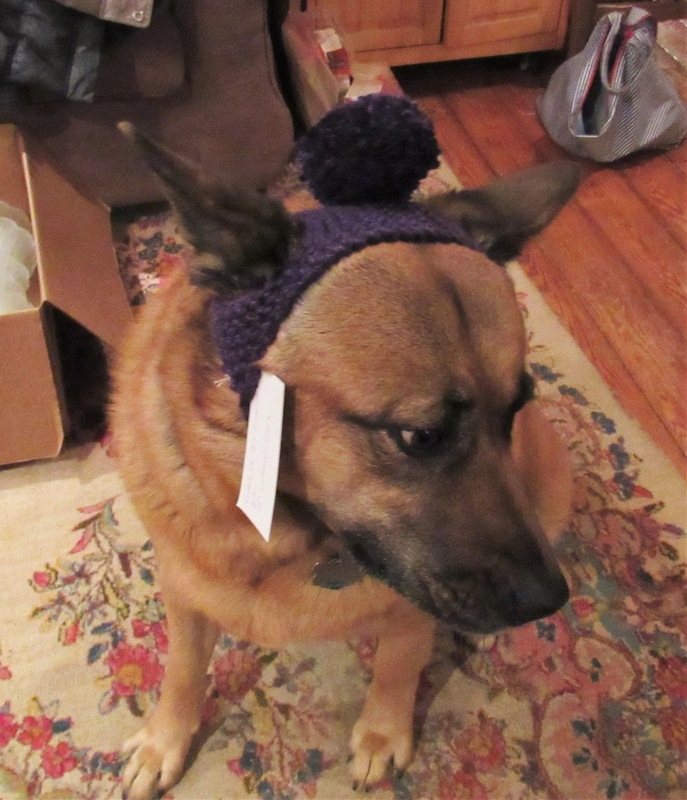 I knit the puppy hat and sewed on a pompom that was about half the size of the human hat's pompom. Look how adorable Nooshi is wearing her hat. Look how the pompom is almost as big as her head! Look how I didn't do a very good job trimming the pompom! Poor little Nooshi! She can barely hold up her head due to weight of that giant pompom. During the design process, I ended up knitting two hats in different sizes so I shipped them both to the customer. Poor Roxy! She looks mortified! Poor Roxy! She's not happy with her new hat. Roxy never asked for a hat, nor is she happy to be wearing a hat, specially a hat with a giant pompom. Luckily, depending on how you look at it, my phone went bonkers yesterday and I spent close to four hours at Walmart's phone center tying to fix it. After a crazy amount of time with Joseph, the extremely helpful Walmart associate (he was so helpful, he deserves recognition,) and a conference call with the phone provider's service rep, I ended up having to buy a new phone. While I'm not thrilled with having to spend the money, or that I lost the majority of my contacts in the transfer, I'm right pleased with my new phone. I'm also right pleased that all that time away from my needles was a huge help to my forearm. I'm also right pleased that while I was leaving the store, I happened to stroll by the craft section and noticed they had a teeny tiny pompom maker. So now, it's back to the puppy hat drawing board. 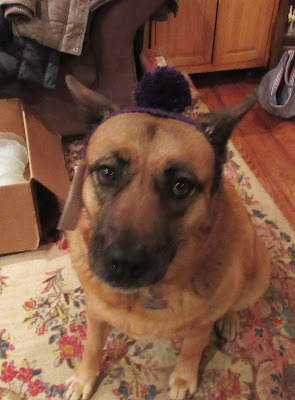 And Roxy, I promise to never again ask you to model a hat. A giant Thank You! goes out to Nooshi and Roxy for playing guinea pig and, despite their pain and embarrassment, for allowing me to post their photos. Hats for dogs . . . who'd have thought? Hope you forearm heals soon (or maybe you could wear something sleeveless while knitting?). 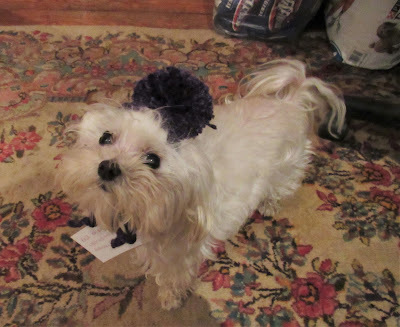 I sort of want to make a hat for my own dog, but she'd eat me while I slept if I put that pompom on her head. She doesn't even like having a corner of a blanket on her. OMG....that first photo of Roxy! If only they could talk! Adorable! Poor pups. My dogs can relate as I am often displaying people hats on their heads. Mine would completely freak out. Poor puppies! I suspect most dogs don't want to wear hats. I recently saw a whole book on hats for cats. That doesn't sound like a winner to me.